Get and apply a special "identity token" from the PayPal account. Described on the Identity Token page. Both are described on this page. This section covers creating a PayPal account for receiving payments if you do not already have one. If you already have a PayPal account, see Upgrading Your PayPal Account below. If you only want to make payments using PayPal just go to paypal.com and use their screens. 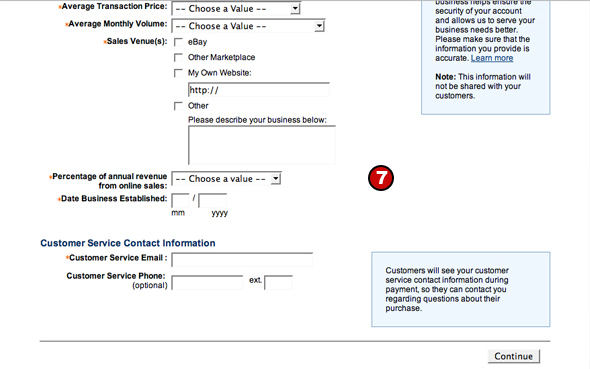 When you create an account, Paypal may offer you a series of questions and options for your account. All you need to accept payments at your HotDoodle site is "website payments standard". This is a free account in that there are no setup or monthly charges for processing website payments. Please note that Paypal may have additional charges if you choose other options such as credit cards by phone, etc. After you have completed the setup screens, Paypal will send you a verification email. Click on the link within this email to finish the setup of your account. 2. Click on the “Sign Up” link at the top of the page. 3. Click on the "Get Started" button under Business Account. 4. Select “Website Payments Standard” as the payment solution. 5. Click the "Continue" button. The Getting Started screen appears. 6. Click on the "Go" button. The Account Setup screen appears. 7. Fill out at least the required information and click the "Continue" button. 8. Follow any additional instructions from Paypal to complete account setup. If you already have a PayPal account and it does not have Website Payments Standard, you can upgrade it. The exact dialog changes often but remember to chose the free Website Payments Standard when given the chance. From here, the exact dialog changes often but remember to chose the free Website Payments Standard when given the chance. Use the PayPal button generator and cut and paste between it an your site.